A two-month long event has kicked off at St Mary’s Church in Wooler. And the central exhibit, from which all the activities over the summer holiday period will take their reference, is the Cuthbert Cloak, a modern artefact commissioned by Durham Cathedral as part of its Treasures of St Cuthbert exhibition. It has been generously loaned to St Mary’s for this exhibition. Crafted by local artist Anna Turnbull, the cloak is breathtaking in its design and artistry, and there is no doubt that it evokes a sense of St Cuthbert’s love for natural and uninhabited places. As part of two months of events there will be a number of talks, workshops and concerts taking place. And this weekend Anna Turnbull will be holding a felting workshop as part of the exhibition. The workshop will take place from 10am to 12.30pm. 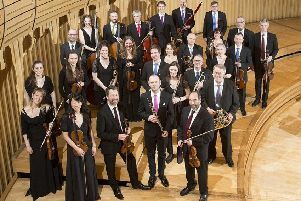 On Friday, August 16, there will be a Northumbrian Concert featuring the well-known local composer and performer Alistair Anderson, together with Sophy Ball and friends. They will be performing Alistair’s own compositions, as well as traditional tunes inspired by, and originating in, the landscapes of Northumberland. There will also be a vintage tea party on Sunday, August 19. And on Friday, August 24, there will be Cuthbert – Songs, Stories and Landscapes, with talented and popular local singer-songwriter Andrew Lobb. Ending the programme of events is an open mic poetry night on Wednesday, September 12. For tickets to the events or more details contact the Rev Suzanne Cooke on 01668 283502 or Meg Hood on 01668 281607.